What’s it like to grow up working on the streets in a warzone, or to spend the first 15 years of your life pretending to be a boy? How does it feel to be one of the first skateboarders in a country, and at the same time a girl in a conservative Muslim society? In a nation divided along ethnic and gender lines, how do art, education and skateboarding create change? After years of interviews, documentation and hard work, the NGO Skateistan is excited to announce the release of its very first book, revealing how a grassroots skateboarding project has made a lasting impact on the lives of Afghan youth. Skateistan: The Tale of Skateboarding in Afghanistan shares the strange and beautiful intersection of traditional Afghan society and a new generation of Afghan skateboarders and artists. Through a balanced mix of words and photographs, the book tells the tale of ‘Skateistan’, which since 2007 has taught skateboarding and creative arts to girls and boys in Kabul, Afghanistan. Skateistan gives a rare, in-depth look into the lives of exceptional young Afghans facing incredible challenges and giving new life to a city that has been ravaged by war. This 320-page color book features stunning, previously unpublished photographs accompanied by essays, interviews and personal stories from Skateistan’s founder Oliver Percovich and the young Afghans that have gone from being streetworking kids to teachers in the skatepark and classrooms. Full of hope, beauty, brutal honesty – and skateboards – this is a story about Afghanistan that you won’t find anywhere else. 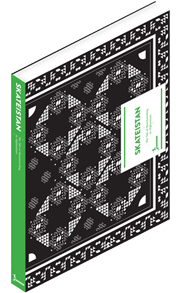 The book’s official release date is set for June 9, 2012 in Berlin, Germany, with purchase available soon through Amazon US, the Skateistan online store, and local skateboard shops. Book Sponsored by: The Kindle Project and the Danish Embassy in Kabul.